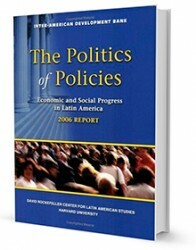 This volume appears after more than a decade of political and economic reforms in Latin America. The success of these reforms--and the quality of public policies--has varied widely. As a result, it has become clear that good policy "recipes" are not enough. Specific policy recipes, no matter how well conceived, are necessary but not sufficient for success. Only by improving the policymaking process can we expect sustainable improvements in public policies and in their impact on development and people's lives. This study analyzes how the workings of the policymaking process affect the quality of policy outcomes. It looks beyond a purely technocratic approach to policymaking, delving into the messy world of politics. It argues that the political process and the policymaking process are inseparable, and that failing to understand one risks failure with the other. It offers a wide variety of examples and case studies, using an analytical framework that can help explain why policies that work in certain institutional environments may not work in others. The study also yields useful insights for the design of effective policy reform. Audiencia: Trade Harvard University Press.